Google Spreadsheets wins the prize for the coolest new features launched this summer in Google's web applications. The magical autofill lets you type the first elements from a series, select them, drag the fill handle (a small blue square) across the range that you want to fill and obtain the rest of the items automatically. It works for time series (days of the week, months), numerical series (arithmetical progressions), a combination between text and numbers (for example: type Q1, Q2 and Google Spreadsheets will add Q3, Q4 etc.) or dates. The other great new feature uses the "online" part from from "online spreadsheet". Now you can add data from many different sources available online: feeds, HTML files or simply text files (CSV/TSV). The data is automatically refreshed, although it's not very clear how often. This is especially useful if you want to import data from multiple CSV files available online. If we couple these new additions with the two other functions that retrieve information from the web and consider that each published spreadsheet is available as a feed, it's clear that you can connect multiple spreadsheets and easily reference data available online. Try filling in a couple cells in a column with some color names, then hold the ctrl key (alt on a mac) as you drag down. It's a bit wonky, but Sets integration is already there :). I'm not so sure about that. Google Sets is used indirectly in Google's search engines (5 points if you find where). The autofill was a long awaited feature so I can only say “yeah, finally”. However the way it's implemented is really impressive. I mean this integration with Google Sets. Thanks to this it became even better than in other spreadsheet applications. And those external sources are interesting. 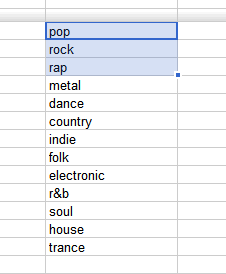 This opens whole new class of things that can be done with Google Spreadsheets. It perhaps may be more useful than I can imagine now. Where else are Google Sets used? I don't know but maybe it's the synonym search (with “~” operator)? Do I get any points? Alex, Am I right in saying that Google Sets is used for showing suggestions in the results page? No, mwgamera is much closer. It's used in the list of suggested search terms. Most of these queries do not work if I try to use true XPath. The error message is hardly sufficient. I wonder if people really use this feature. The example works, but I try with a authenticated web service and didn't work. Anybody try with authenticated web services ? Do you know if exists official documentation about this feature? =GoogleReader function doesn't work. Does it exist at all? Heya…wondering about scape formating or regex with index() combined with ImportHTML(). Trying to create spreadsheet table pulling live sliver and gold values…I would use yahoo but they don’t/can’t find the silver index so been looking around the net and finding little, but what I did find gave me back — ‘LAST : *16.88*’ — asterix included. I have looked around for regex axample and colab, but haven’t found yet. how can I import a div element, not class or table?! Since 2007, the year this post had been created, Google Sheets advanced significantly. Probably one of the most widely used functions is IMPORTRANGE to import data from multiple Google Sheets. However, I found IMPORTRANGE hard to use and not very beginner-friendly. I kept searching and found Import Sheet , a Google Sheets add-on that provides a visual interface to create connections between multiple Google Sheets and MS Excel documents. 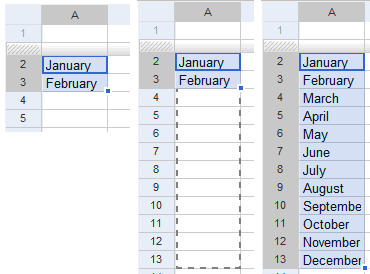 These connections allow you to schedule imports and exports of data between these multiple sheets. Maybe it's useful to someone reading this!